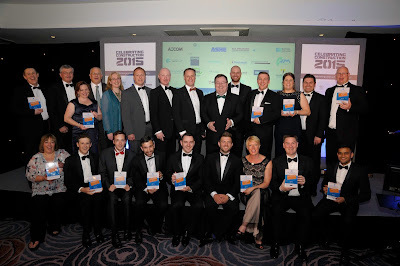 More than 300 leaders and innovators from across the construction sector gathered at the Nottingham Belfry for the Celebrating Construction Awards. Held for the first time, the prestigious ceremony commended the East Midlands' most inspiring construction projects and people. Head of East Midlands judging panel, Alan Coole from Scape Group said: "Historically the East Midlands has been under-represented at the Celebrating Construction Awards, however by launching our own inaugural East Midlands Awards, we have attracted over 100 entries and created a sell-out event. There are many pockets of excellence in the East Midlands and we are proud to have showcased the skilled people who work here to the region and subsequently at a National Level." Renowned business journalist, speaker and conference chair, Declan Curry hosted the awards and spoke about the return of the East Midlands Awards after an absence of four years and the outstanding quality of the entries reflecting the improvements the industry are seeing in the economic indicators for the region and a growing confidence in the construction industry within the East Midlands. The big winner on the night, Robert Woodhead - picked up four top honours, including three awards for their innovative Lincoln Castle Revealed project - winning the prestigious Project of the Year, Heritage Award and the Legacy Award for Sustainability. Lincoln Castle Revealed has brought the Castle to life like never before through immersive interpretation, compelling architecture and unrivalled historical significance. The project consists of three major phases, The Heritage Skills Centre, The first new build within the Castle for over 150 years. The Conservation of Lincoln Castle Walls, the refurbishment of the Prison and new build Subterranean secure Magna Carta Vault which will be the new home of Magna Carta (1215) and The Charter of the Forest (1217). The vault is the only place in the world where the historic documents can be viewed together. Other award winners included; VincentStokes, B & K Structures, Leicestershire Fire & Rescue Services, Lift & Engineering Services, X-LAM Alliance, Anglian Water and EOS Facades. The Celebrating Construction Awards are presented by the Built Environment Hub, a membership organisation created to drive best practice in construction product and process innovation in the Midlands region, in association with Scape Group and Salus Approved Inspectors. The Awards were hailed as a great success by entrants, judges and attendees alike. The East Midlands winners will now gain a place at the finals of this year's national Constructing Excellence Awards which are being held in central London in November. There has already been a great amount of interest for next year's Celebrating Construction Awards. If you are interested in getting involved, there are 10% early-bird discounts on sponsorship opportunities booked before 01 October 2015 - email amy.pryce@builtenvironmenthub.org for details.